It's late, but the review has arrived! As soon as I finished reading Hellforged by Nancy Holzner, I knew I had to offer my thoughts. The second novel in a series filled with creativity, excitement, and a strong, easy-to-relate-to heroine, I was riveted from start to finish. Urban fantasy fans, you will love this one. Minor spoilers to follow. Gotta love covers with strong women and big swords. 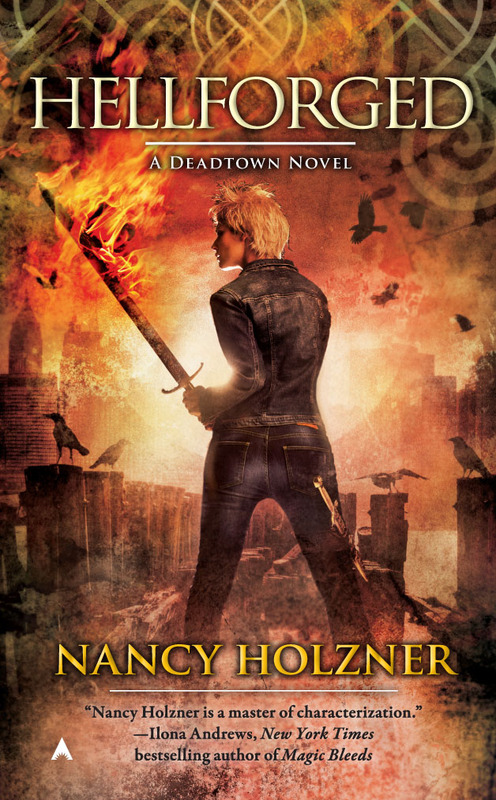 While I enjoyed the first novel, Deadtown, I truly counted myself a fan after completing Hellforged. The story was more complex, the situations more dire, the backgrounds of the characters more developed, and the action far more intense. And trust me when I say that Deadtown had no shortage of any of those. I think the reason I preferred the sequel to the first novel is because there was more of everything. An extra ten chapters filled this novel, and we were given more insight to Vicky's mentor and aunt, Mab, who has a compelling back story. The fight scenes were also way more intense and more frequent. Except for a few scenes, I never truly felt like Vicky was in danger in the first novel. Hellforged however, changed all that. The rational part of me knew that there were more books after this and she had to survive, but I was biting my nails as I read through the final chapters. One of the things I've quickly come to adore about the Deadtown series, and this novel in particular, is that nothing is an accident. Every scenario, no matter how random it may seem, ties back to the central plot in a major way. When the pop star/concert story line was introduced, I didn't see what it had to do with anything. Little did I know that it would literally be the setting for a truly epic battle. Every character is strong and memorable, but Vicky is the highlight. She's a great heroine– brave and strong, but still a student in demon slaying and vulnerable when she doesn't want to be. She's definitely a character I want to see grow. Holzner is a fantastic writer. She imagines up fantastic scenarios and scenes, pulling the reader in with an engaging style and strong voice. I still have another 2.5 books to finish, but I've already per-ordered the latest novel. An absolute must for urban fantasy fans who like carefully considered worlds, strong characters, intriguing plots, and edge-of-your-seat action scenes. Vicky definitely lives up to her true name– Victory.